Entrepreneurs want to solve problems. Whether they are launching a new product or service, innovating a process for an existing company, or creating a social impact venture to make the world a better place, they're driven, self-motivated, and resilient. You're part of a growing number of students who want to run their own businesses. You want to be a freelance professional in charge of your own career. You want to lead innovative projects within an existing organization. Entrepreneurship is a discipline that is best learned through practice and iteration. Taking risks, failing, reflecting, and trying again are at the core of both entrepreneurship and Millikin's commitment to Performance Learning. 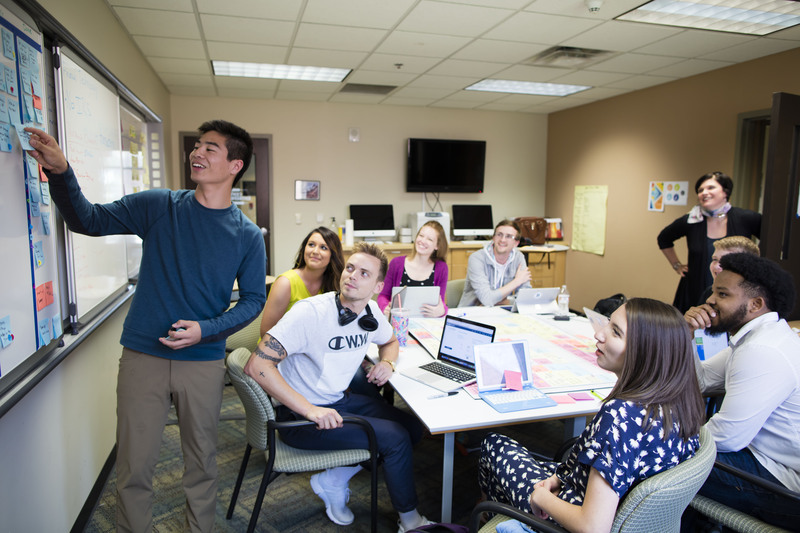 Entrepreneurship students learn by developing feasibility plans, running market tests, pitching ideas, launching micro-ventures, and managing student-run ventures. All students start their own micro-venture, either in a small team or independently. It may not be the business you will run your whole life, but you will experience what it takes to launch a program in a short period of time. Student-run ventures are credit-bearing classes in which students practice entrepreneurial skills within different industries. Pursue a rigorous and diverse Bachelor of Science. Explore the skills needed to excel in strategy and product development. Build skills for creating and articulating possible solutions to challenges. Build a team to launch a business. Develop an entrepreneurial mindset and learn business basics. Create a portfolio to strategically position yourself for any opportunity. Whether you are a sculptor, dentist, or architect, learn what it takes to own your career. Interested in entrepreneurship but not sure how to fit it into your schedule? Check out our two undergraduate certificate programs. Arts entrepreneurship: Learn about essential startup tools and the art of pitching a business ideas. Start your own micro-venture and manage a student-run venture with a team of diverse students. Most students reflect that they learn valuable insights about themselves and gain tremendous confidence throughout this process. This certificate is compatible with studio art, music, dance, theatre, English, and many other majors. Entrepreneurship: Learn about opportunity recognition, innovation tools, and problem-solving techniques through your work with student-run ventures and innovation challenges. This certificate is well-suited for students majoring in science, nursing, pre-professional programs, information systems, and other business majors. Although Millikin's various business pitch competitions are open to all students regardless of major, entrepreneurship students have traditionally performed very well. Over the past three years, teams have won over $25,000 in seed capital. Millikin's commitment to entrepreneurship starts in your freshman year with the annual Freshman Business Plan Competition, in which the awards are travel vouchers. Entrepreneurship majors may be eligible for a selection of scholarships. Some entrepreneurship graduates initially work for companies and organizations directly or through contracts as they build a unique portfolio of experiences, networks, and achievements. Students planning to take over a family business may choose an entrepreneurship major to stay on top of innovative practices. Entrepreneurs often gauge their careers by what value they have created for their clients, what opportunities they have captured, and what impact they have made on the world around them. Our economy is driven by small business owners!